Dimensions: 55 Inches Wide, 35 Inches Deep, 35 Inches High. 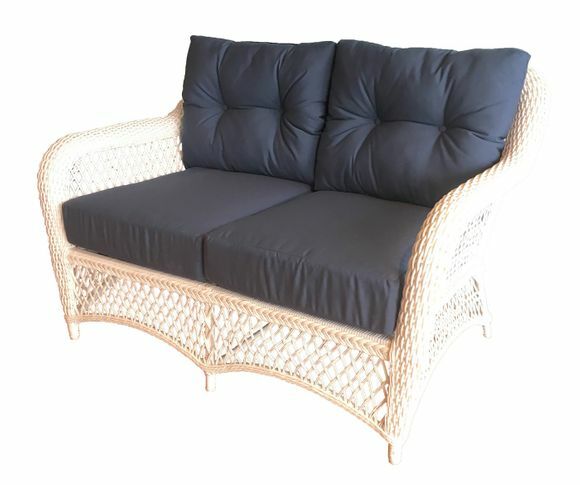 The Seville outdoor wicker loveseat is finished in white high quality synthetic wicker and features cushions in Sunbrella high performance fabric. Large round core wicker weave and double stranded lattice work in a classic traditional wicker styling. Equally designed for either the patio or front porch this loveseat is made to last. 55 Inches Wide, 35 Inches Deep, 35 Inches High.